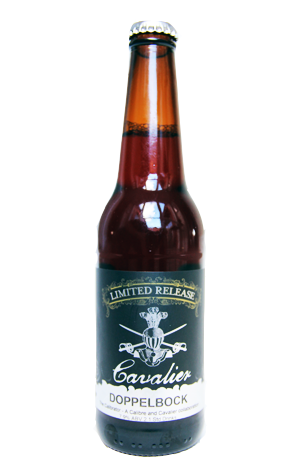 Earlier this year, Cavalier started bottling a small amount of its growing number of limited release beers, beers that are more often than not brewed in collaboration with other brewers or venues and tied into a particular event. Thus we're a little late getting onto it as this is beer four in the series to be bottled. The Belgian IPA brewed with The Burrow is gone, although there should still be a little of the Cherry Sour brewed with the Great Northern and the delicious Baltic Porter created with The Palace Hotel for their Good Beer Week Hand Crafted event in May around. To date, the easy standout for us has been that Baltic Porter, although this Calibrator concocted with the brewery's Queensland distributor Calibre is a tasty winter warmer too. For the uninitiated, a doppelbock is a German style of beer: a strong (doppel means double) dark lager (or bock, which also means goat but there's no goat in the beer as far as we're aware). The two C's have come up with one that nudges 8 percent ABV without the hefty body one might expect at that weight: a glistening chestnut coloured beer that sits somewhere between golden syrup and treacle with a dash of toasted biscuit – a little Anzac biscuit like in fact – balanced by a wisp of spicy hops and leaving a sneaky warmth behind too.